I was having one of those classic everything goes wrong rainy Monday mornings so I knew I should have let M. pick instead, but no, I had to go and suggest Cocoron. Which is, of course, closed on Mondays. Which, of course, we didn't remember until we were standing outside the shuttered gate. 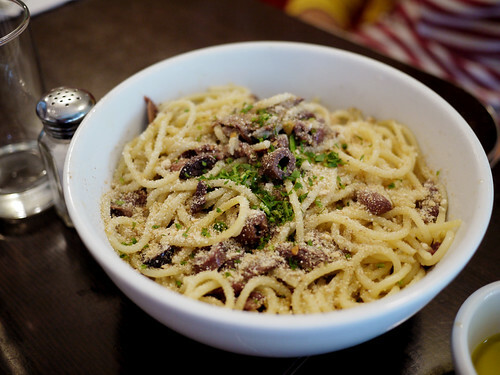 We headed back west with no particular destination in mind and found ourselves at Fiat Cafe, cozy and comfy with large piping hot bowls of pasta. That's a pretty fantastic fall-back if you ask me.